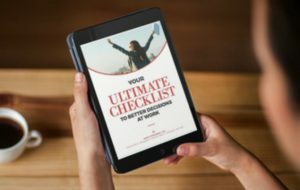 Your Ultimate Checklist to Better Decisions at Work is here! In it, I’ve clarified the 10 essential elements to help you get unstuck and make your next decision with more confidence and less stress. You might be surprised at how many of the 10 you already have . . .
I’ve used this checklist with my private coaching clients and in my corporate workshops, and I’ve seen it help people speed up their decision-making (and slow down their worrying). It’s a powerful combo, and it’s all yours. If it’s time for more support as you make your big business and career decisions, why not request a complimentary coaching consultation with me? I hold time each month to chat with members of my community at no cost to you, and by virtue of you being here, you’re invited to request one of my open slots! After you’ve shared some basic info, my team will be in touch to schedule a 30-minute phone or Skype chat with me. There’s no obligation and often, I can be of help immediately. For other tip sheets, videos, articles and resources to help you in your life at work, visit my Free Tools library here.